Post subject: Most Recent Gig and Next Gig? I have been lurking for a while now and have decided to take the plunge and make myself known. The most recent gig I have been to is The River Detectives at Motherwell Civic Theatre on Sunday 24 September 2006 (which was AMAZING!!) and the next gig I have tickets for is James Morrison at The Old Fruitmarket in Glasgow on Sunday 8 October 2006 (although I have not yet heard any of his stuff). What are your most recent and next gigs? My last one was Wanda Jackson last week and she was fabulous. There were three Hawleyboarders and Hairy's sister at the Wanda Jackson gig. 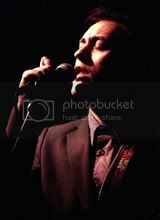 My next gigs (at the moment) are Richard at Shepherds Bush and Sheffield. Hope you get tickets to Shepherds Bush, if they are sold out there was one on e-bay. ooooo although everyone already knows my next ones at Mr H's Sheffo city hall! Shame I hadn't started on the forum then - it would have been nice to have company! I'll certainly have a look on ebay if I can't get a ticket from one of the ticket sites - thanks! Sorry I got greedy and included my next three! most recent gig was one played at - Dylanfest at west st live on sunday night. next gig is tonight - ryan adams in manchester. Last gig was Mr H in Manchester (I think) and next one is The Lonesome Penniless Cowboys on the train home tonight! Sorry, that should be Salford, not Manchester (just in case a certain former timelord should learn of my error). welcome to the all-knitting, all-haircutting madhouse chicagrande! Most recent was M. Ward two weeks ago; next one is Sufjan Stevens on Friday. Off to see Sparks next Thursday in Glasgow-should be a hoot! Unintentionally, The Rezillos in Murcia.....Gave me the horrors. Intentionally, M. Ward in Glasgow and Yo La Tengo at Indian Summer. I guess I'll see the Fannies on Friday.